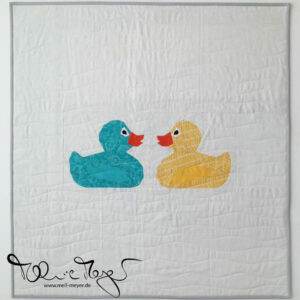 I will now join my first quilt along, yeah! Elisabeth from Oh, Fransson! is hosting it for her new pattern. 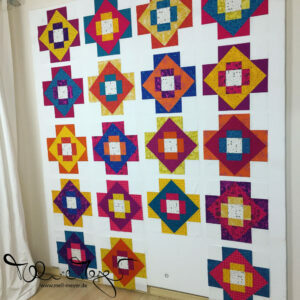 The informational post for the QAL is here. So I have just in time picked my fabris. I have ordered quite some kona cotton solids wanting to do a solid version as well. I have ordered a quarter meter of every fabric of these collections: Elisabeth Hartman, Summer ’13 (the new colors of 2013) and Patchwork City Summer. From this quite impressive stack I have picked a new combination. Unfortunatly I have forgotten to order a new color card. So I don’t know all my colors. I will add them later. I have choosen yellow/orange and pink (warm colors) & petrol/turquoise and green (cold colors). My neutral group is grey. 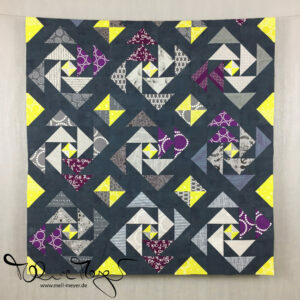 Almost like the original – but first I like the original a lot – just not so much the purple – and second I have enough white and grey for the additional fabric borders and accents from art gallerys basics here already. For everybody who want’s it as well – here is the chart. And the result was quite unexpected to me, I would have guessed that I had used more of the pattern colors. Thanks so much! Do you know what color gray yardage you used for the background? I am sorry, the light grey sashing/ background is just „some“ grey popeline I found here in Hamburg around that time. I think it is closest to Iron on the Kona Cotton Chart and on my very old Bella Solids Chart it is closest to Silver. Hope that helps.